Melges 32 teams take racing down to the wire in Newport at Nationals. Newport, RI – After three more races at the 2012 Melges 32 U.S. National Championship hosted by Sail Newport, reigning North American Champion Ryan DeVos (Macatawa, MI) with tactician Ed Baird on Volpe steps into the overall lead. In second place is Gold Cup Champion Steve Howe (San Diego, CA) and tactician Morgan Larson on Warpath, tied with equal points. Jason Carroll’s (New York, NY) Argo with Cameron Appleton on tactics is third, only three points behind. Racing commenced on time with an initial 5-8 knots of breeze and patchy blue skies. From start to finish, DeVos and Joel Ronning (Minneapolis, MN) aboard Catapult battled hard for the lead position. DeVos was fast, however Ronning managed to get around him at the final weather mark of the race to take the lead. Downwind, they kept each other in check as Ronning held on to win, DeVos finished second while Michael Dominguez (Barrington, RI) on Bronco came third. Ronning went on to sweep race two as well. This time, Dalton DeVos (Macatawa, MI) on Delta and Carroll took turns trying to chase Ronning down. Ronning claimed his second bullet of the day while DeVos finished second and Carroll was third. As the day went on, the skies became cloudier and the breeze remained shifty as the anticipated rain moved ever closer. Alexis Michas (New York, NY) on Zetiana took leadership of the fleet early and held on for the win. On the last downwind run, Howe made a great attempt to catch Michas, however ended up settling for second. Dominguez had another great race finishing third. Sunday’s racing surely will be dramatic as ten points separate first and fifth places, revealing that this Championship title is still very much up for grabs. The 2012 Melges 32 U.S. National Championship, hosted by Sail Newport and headquartered at the Newport Shipyard, will conclude on Sunday with the first warning start at 11.00. Full race reports, interviews and photo galleries will be posted each day at the official website of the International Melges 32 Class Association (IM32CA). Racing updates from the course will be posted online at the Official Melges 32 Blog, Facebook and Twitter. 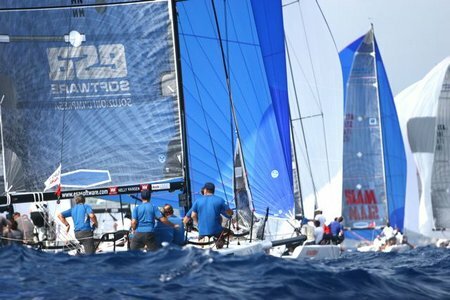 If you are unable to attend the 2012 Melges 32 U.S. National Championship, stay in touch by subscribing to the IM32CA RSS Feed.